Certain things about flying do not change. It is a truth universally acknowledged that a gentleman, upon boarding an aeroplane for a long-haul flight, should turn, not to his right, but to his left. As the world’s worst passenger – grumpy, impatient, anxious, fearful and insomniac – I am peculiarly well-placed to testify to the accuracy of this statement. A purgatorial period of ten or eleven hours in the air is not my idea of fun, and the thought of having to endure it after the dreaded veer to the right is more than my feeble frame can endure. It has, alas! occasionally happened, but I do not wish to depress you with any words about the horrors which ensued. Let us think rather about the left, which is a different matter altogether. On the left is the promise of comfort, attentive service and even – dare we whisper it? – luxury. The promise, of course, is not always fulfilled. But, when it is, the experience of air travel becomes really almost pleasurable. I therefore hereby record my thanks to Virgin Atlantic and its Upper Class service. I am, as my regular readers will know, a lover of humanity. But even I find the crowds at airports rather unsettling. But with Upper Class they are quickly left behind. My flights were from Heathrow to San Francisco and return. In both places before going to the departure gate I sped to that sanctuary of soothing calm: the Virgin Clubhouse. In London it is a place of muted tones and low background music. It has the feeling of an ocean liner. Herein one can find friendly folk who will clean your shoes, massage your limbs and serve you food and drink. I partook of mushrooms on toast, crisp bacon, fruit salad and Earl Grey tea – all of which were excellent. In its San Francisco incarnation, the Clubhouse is very blue and very stylish. It is also before Security, so I had to make sure I had extra minutes to get to my aeroplane. I should, indeed, have allowed more time to enjoy the Clubhouse’s facilities. Still, I did manage to get through a goat’s cheese and beetroot salad, pan-fried tilapia (a tasty white fish) and roasted peaches with cream – washed down with glasses of a decent chardonnay from California’s Central Coast (Cupcake Vineyards,2010). It is difficult to give you a price for the return ticket on Upper Class. As with all the airlines nowadays, the prices go this way and that and depend on very many factors, most of them beyond my ken. Suffice it to say that, if you can book a very long time ahead and you do not need any element of flexibility, you can secure a fare of around £2,500/£3,000 – which strikes me as something of a bargain. Allow me, then, to describe for you the experience of my flight to San Francisco. The turn to the left made, I surveyed my surroundings. The cabin was spick and span, in the way we expect, and the colour scheme of grey and purple was pleasant. The seats were arranged diagonally, upholstered in soft leather and had high sides. I felt that I had entered a small area of my own. It was not exactly a private world, but it did seem like a separate world. Soon I was enjoying a glass of champagne. I was reassured – as I always am – by champagne’s magic ability to maintain its bouquet in even difficult environments. There were, of course, electrical controls for all sorts of things, and I am sure that the many of you who do not share my own technological illiteracy would have enjoyed playing with them. I was simply relieved that there was one for the lumbar support in the seat, so that my role as Martyr to the Bad Back could be cast aside for a few hours. I think it would have been possible to eat the main meal at any time (from the appropriately entitled ‘Freedon Menu’), but I was content to join my fellow passengers in dining soon after take-off and thereafter attempting to find the Land of Nod. A white linen tablecloth and napkin therefore appeared on the substantial table which the stewardess had caused to appear before me. Strong, straightforward flavours are what we need in the clouds, to overcome the destructive effect on our palates of the pressurized cabin. A salad of halibut, smoked salmon and marinated prawn, with radish and balsamic lemon dressing fitted the bill, as did the following beef Wellington with rosemary jus, dauphinoise potatoes and roasted root vegetables. Then came the two courses which always seem to be good in the air – cheese and pudding. I particularly liked the Shropshire Blue, served with crackers and grapes, and the sticky toffee pudding with vanilla sauce, with which, at my request, I was served the only comestible which truly glories in high altitude – ice cream. The wines were all supplied by Berry Brothers & Rudd. For your convenience, I sampled four of them, each poured by my steward. I am not sure my tasting notes would be of any use to you, for wines and our palates’ responses to them change so dramatically at high altitude. It is better, I think, if I offer general advice. Go for big wines with distinctive characteristics – like sauvignon blanc (gooseberries and cat’s pee) and malbec (ripe black fruit) – and do not expect the subtleties you look for at ground level. Thus excellently fed and pleasingly watered, I was ready to attempt to achieve the impossible – sleep. Were I not so anxious about what might happen in an emergency, I would probably be willing to take an elephant-sized sleeping draught to bring on oblivion, but the next best stratagem on an aeroplane is to lie horizontally. The charming stewardess appeared and performed her magic. With the pressing of buttons and a modicum of whirring, my seat was transformed into a completely flat bed. I did not put on the ‘sleeping suit’ which was offered to me – the prospect of climbing in and out of pyjamas within the confines of the loo being somewhat off-putting at my advanced age. But I did get onto the bed, with a pillow under my head and a blanket over my body. Did I sleep? I supposed not, but I think that on this occasion I must have supposed erroneously. I simply had to have slept, for otherwise the many hours would not have passed so quickly. Indeed, even before I had time to get truly grumpy, I was being served afternoon tea, with chicken sandwiches, cup cakes and – the highlight – an excellent warm scone. And then it was time to prepare for the landing. Even for his miserable flier, this was a good flight. Remember, then: a gentleman (or a lady) must always turn left when entering an aeroplane. 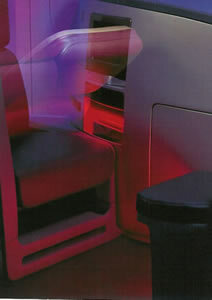 Remember, too: if you are on a Virgin Atlantic aeroplane, you will be about to enjoy Upper Class.